Our Yahoo group is essential for any parent who has a child in the band. Without being a member of the group, you cannot receive fundraising information, requests for volunteering and more. All booster business for the band is done via this group. All E-mails come into your inbox with the the beginning of the subject line: [gchsbands] so it is easy for you to filter and search on messages. Send a request from your e-mail address at which you wish to receive your messages to: Do not type a message or a subject just simply send the e-mail. Once you send the e-mail you will receive an e-mail back from yahoo groups. If you do not receive an e-mail quickly check your spam or junk mailbox. Open the e-mail; you will have two options to pick from in order to proceed. Choose option number 1 (one). A "Request to join gchs bands" page will open requesting your comments. Please type your name and your students name so the moderator knows who they are approving. Then click Send Request. 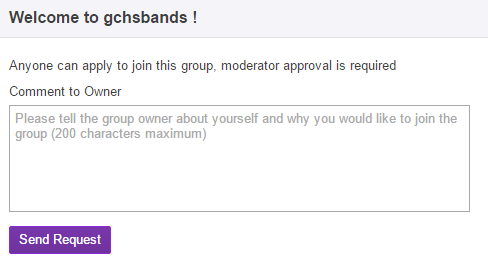 At this point your request will be sent to the group moderator for approval. Once you are approved you will receive an approval e-mail and a welcome e-mail. The staff and moderators of the Yahoo Group cannot remove you on your behalf. This is something that is required to be done by those who are subscribed. To unsubscribe. There is an "Unsubscribe" link at the bottom of each e-mail that is sent to the Yahoo Group. Click that link and follow the prompts. You will be removed from the group.